This weekend I had the great good fortune to have a two day signing at the Houston Charity Cat Show along with my good friend Miranda James aka Jimmie Ruth Evans aka Dean James. 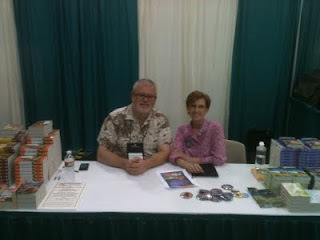 I met so many wonderful readers and cat lovers. The kind people at Murder by the Book brought our books to sell, as well as many other cozy titles that either have a cat theme or a cat on the cover. I was very heartened to see so many people still in love with books made of paper. They are friendly, nice and passionate about reading. The cats and kittens were wonderful to see--so precious, so gorgeous and such a variety. As a writer, I must say I loved the opportunity to also "people watch" as much as "cat watch." I saw a woman in a gorgeous dress--obviously custom made as it fit her figure like a glove. She really caught my eye and only after a second look did I realize the fabric had cats all over it. Her companion wore a vest made from cat-covered fabric, too. Dean and I also saw a very unusual looking man with what I can only describe as "big hair." Like Liberace hair, as Dean so succinctly pointed out. Liberace hair and a deep fake tan made me wonder if this guy had just escaped from a Vegas magic show. Some of the other clothing I must keep to myself because I plan to describe some of these outfits in future books--most probably worn by Lydia Monk. If you know my books, you kind of get the picture. At shows like this, there are many different vendors. Homemade jewelry is everywhere. T-shirts and cat toys, too. Caps complete with kitty ears, as well. The amazing amount of cat jungle gyms sold had us all wondering if the guy selling the carpet covered contraptions would retire to a tropical island by Monday. Then there was the vendor right across from where Dean and I were signing. Cat clothes. Lots and lots of cat clothes. My cats would never stand for frilly outfits, but apparently there are many cats who apparently don't mind at all. The only problem was the stuffed red cat used to "model" one of the outfits. The vendor set it on top of a stand so it was at my eye level. All I can say is ... creepy. Very creepy. How about you? Ever been to a cat show? Or to a similar event where you might just see the unexpected? Hi Leann, what a lovely experience. 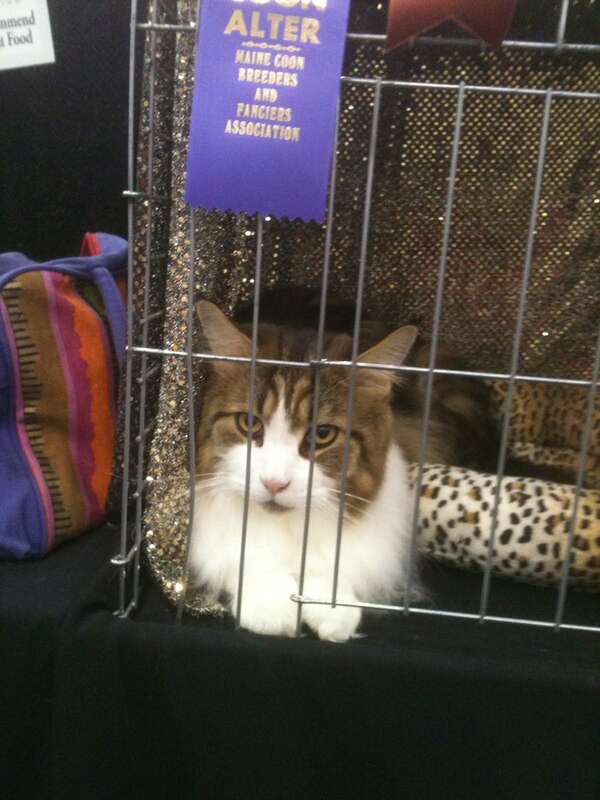 I've never been to a catshow, as I am way too allergic to that. And I don't even know if they excist here in Holland. There is a yearly fantasy event close by, which I love to visit. They invite authors and actors to visit and give lectures, and of course authographes and pictures. (For a fee...). But I have met Cate Tiernan, a YA author I have adored for years, and James Masters, Spike from Buffy the Vampire Slayer, and the Hulk! You guys look great! (A sight for sore eyes.) Look at all those books! Look at the buttons! Glad to hear you had a fun day. We saw so many little girls who LOVED getting a free button. I had a few of yours left, Lorraine, and I only have one Miss Marple left for today's show. Sounds like so much fun! Pet some kitties for me, okay? I would love to have a cat in my lap while signing. Some of the breeders are pretty protective and I don't blame them! Such beautiful kitties--like the one in the pick who was nice enough to look at me to have his picture taken! Oh I can't wait to pay attention to the outfits in your future books. What fun! I had an even greater time watching the cat people, though. All kinds of people, some of whom looked like their cats and made me smile. As a family we have always had cats and I have to say I have loved all of them for different reasons, simply because they have all been different. We have never taken any of them to a cat show as they have all been moggies, nevertheless if we had I am sure one or two of them would have won if only on personality alone. The cat show sounds like such fun, especially the people watching. I hope you sold lots of books! I see a lot about you in this blog and elsewhere, Leann, but I am curious about what books Dean James has written lately. My favorite series by him is the Trailer Park one with Wanda Nell Culpepper. (writing as Jimmie Ruth Evans) I'll bet you two had loads to chat about. I've been to dog shows and had a similar reaction. Dog people are a hoot and although I love dogs, I just couldn't get over their people. I've never been to a cat show and I would love to go, but I don't think I'll last an hour, darn allergy. We have been to quite a few cat shows before...it's really cool to see the crowd and the unusual breeds.